My current favorite beer made by Pizza Boy Brewery is SereniTEA. It is a cream ale with a refreshingly smooth taste and a subtle hint of tea flavor. I always enjoy trying something new from the vast selection of beers on tap at Al&apos;s of Hampden. 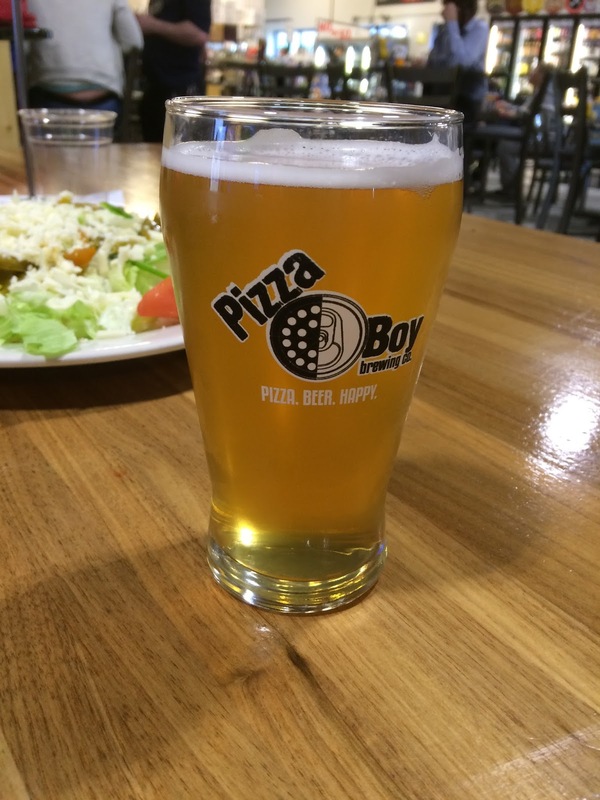 There is quite a variety of Pizza Boy brews to choose from in addition to many more from various popular breweries. It&apos;s easy to find one that tastes great with whatever you choose from their menu of good food. I&apos;m always happy with my visits to Al&apos;s of Hampden. My absolute favorite local beer is the Chocolate Avenue Stout from Appalachian Brewing Company. I love stouts to begin with because they are rich and remind me of dessert. This one is no exception and it’s nice and sweet with a deep chocolate flavor. I’d have to say a close second is also from the Appalachian Brewing Company, their Trail Blaze Maple Brown Ale is also delicious and the natural maple syrup flavors are hard to find anywhere else. When you visit plan to stay awhile, because they also have a delicious menu of appetizers, burgers, sandwiches and entrees. While I share Kristen’s sentiment on the Trail Blaze Maple Brown, my favorite is also from ABC, but it’s their Water Gap Wheat Ale. It’s a light ale that goes down easy…perfect for summer. ABC typically serves it with a lemon to enhance the flavor. ABC has a number of delicious specialty and seasonal beers that you need to be on the lookout for as well. On a recent date night, my husband and I decided to stop by Harty Brewing Company. This small, family-owned and operated nano-brewery and taproom was busy but we managed to find a spot for two at the bar. We ordered a flight that included their American Pale Ale, Hefewiezen, Harty IPA, and Oatmeal Stout. They also serve cider from Big Hill Ciderworks and local PA wine from The Vineyard at Grandview and Seven Mountains Wine Cellars. It was a cold evening and I enjoyed the tasty Oatmeal Stout. Finish off your evening by walking across the street and enjoying dinner at Sophia’s at Walden. 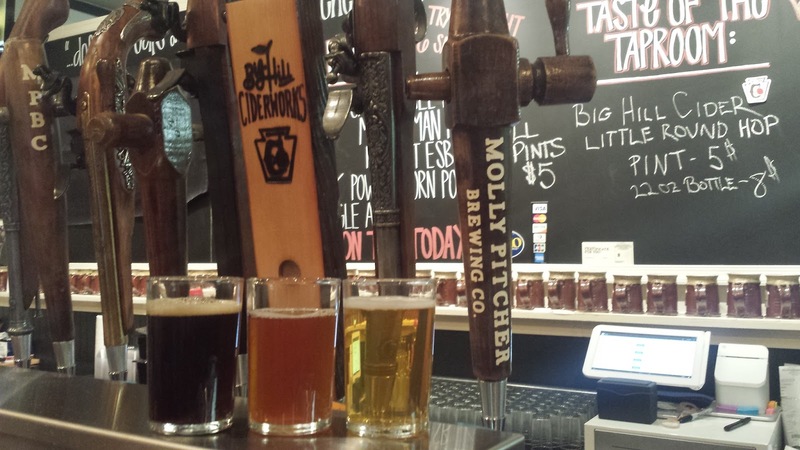 Tap and tour the Cumberland Valley Beer Trail from Carlisle to the West Shore! Since my favorite brews are sweet fruit beers, it’s no surprise that I love hard cider. One of the best I’ve tried is Jack’s Hard Cider from Hauser Estate Winery. The apples are grown, pressed, fermented and bottled on-site and available for sale at select locations throughout Central PA. There are numerous varieties available, including a sweeter (Helen’s), mixed fruit (peach or pear) and seasonal (Fireside and Conewago Orchard), but I prefer the original (look for the red can). Not too sweet, not too tart, the Jack’s blend is the perfect mix to sip. 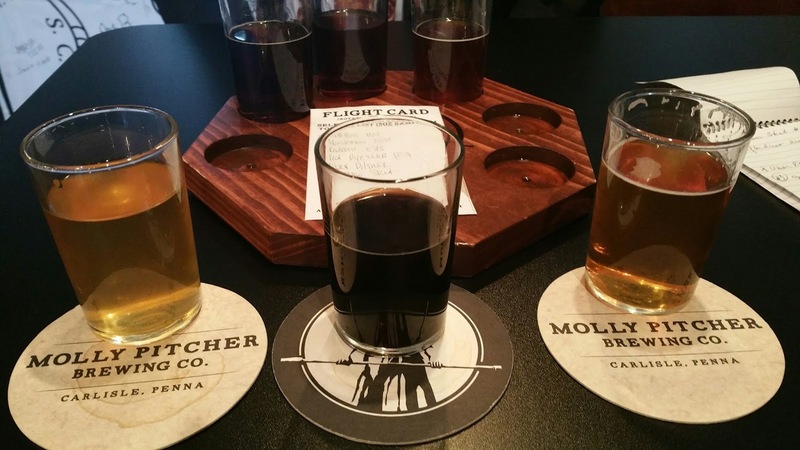 For those that love beer – you are sure to find your favorite wheat, malty or hoppy one – there are 10 choices to choose from at Molly Pitcher Brewing Company. For those that do not, you will also find something that you absolutely love! I asked the waitress for a nice sampler tasting from light to dark – knowing that I would prefer the lighter side – but amazingly, I ended up choosing tastes from the full spectrum. #1 – War Ball Wit – the lightest of the 6-taster selection – and oh my this is the perfect “any and every day” beer – creamy, sweet and the hint of orange and cinnamon adds a refreshing dimension. #2 – Espresso Stout – the darkest of the selection – looks like old motor oil but is the perfect espresso finish to any day. It has a liquor like quality without the syrupy aftertaste. Whether you like coffee or not, this is a really well-crafted beer. 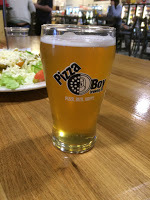 #3 – Uber Pilsner – a reddish beer and the perfect beer for pizza. It has a hint of bitters and what I thought was some grapefruit. The Molly is a fun place to hang out and have a beer or two and some snacks. There are a few tables located outside. The inside has a happy hum of friends having some laughs and relaxation. You can pick up beer to go by the bottle or growler. Check their website for offerings and hours. One of my favorite local beers is the Black Powder Stout at Molly Pitcher Brewing Company in Carlisle. A lot of their brews are good, but I really like the smooth, robust flavor of this stout. It has a really nice chocolatey, coffee rich flavor. This is also a great place to hang out if you enjoy craft brews, as you can get a sampler or try out their new evolving options. As a self-proclaimed history buff, the Revolutionary War themed beers and unique flintlock taps add to the experience.